Quick. 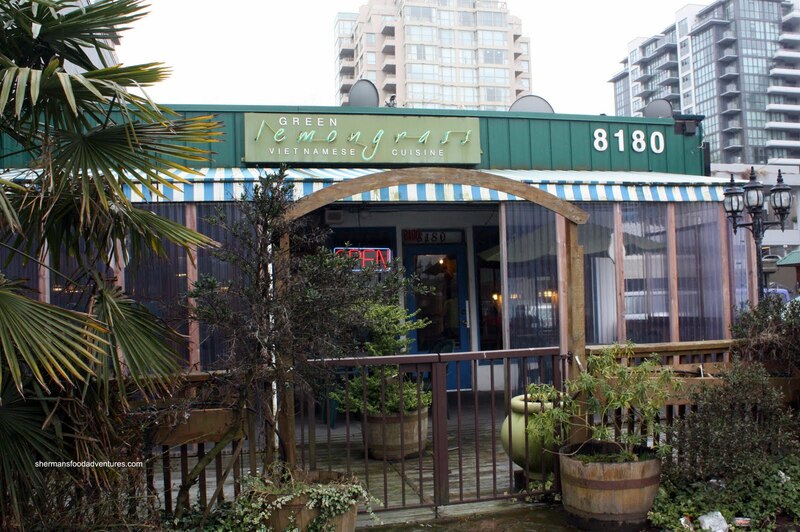 What is the first thing that comes to mind when you hear these 2 words: Restaurant and Richmond? If you answered stolen parking space, you are partially right; but there is a better answer. The correct answer would be Chinese restaurant. If you had that in mind, then you realize that the plethora of Chinese restaurants completely overshadow everything else. Sure, there are Japanese restaurants as well; but that would the extent of diversity you'd find here. 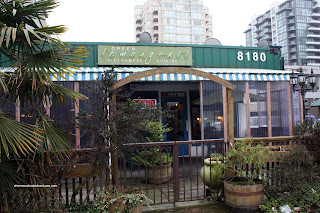 However, housed in a little building that resembles the shack from Gilligan's Island resides Green Lemongrass Vietnamese Cuisine. Sharing the same parking lot issues as its bigger Chinese restaurant neighbours, the place looks really out of place amongst more modern buildings. As for the limited parking spots, you'll probably be better off parking somewhere else. The lot is narrow and always full. Meeting up with Rich Guy for lunch, the place was completely packed. No matter, Rich Guy was having a bit of difficulty finding a parking spot, so waiting was a given. I wonder if he lost his parking spot to anyone? So when we got down to ordering, I stupidly picked 2 different salad rolls. 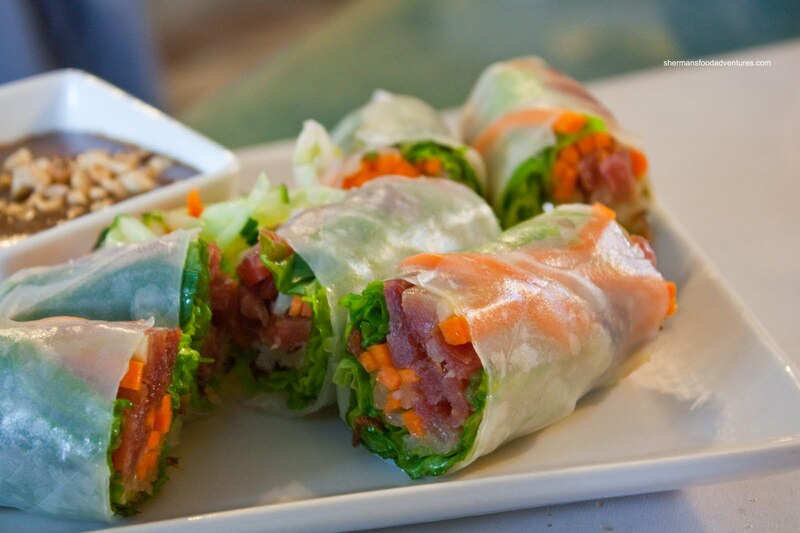 We started with the regular Salad Rolls. These were pretty good. With just the right mix of shrimp, pork, vermicelli, lettuce, beans sprouts and perfectly textured rice paper wrap, it was texturally pleasing. However, the peanut dipping sauce was a bit unbalanced with too much hoisin. We also got the Phnom Penh Salad Roll partly because it had sausage in it. Wait, that didn't come out right... Anyways, it was a combination of sausage, pickled carrots, onions, lettuce and mushroom. It could be eaten without any of the dip since it was flavourful in itself, albeit dry. 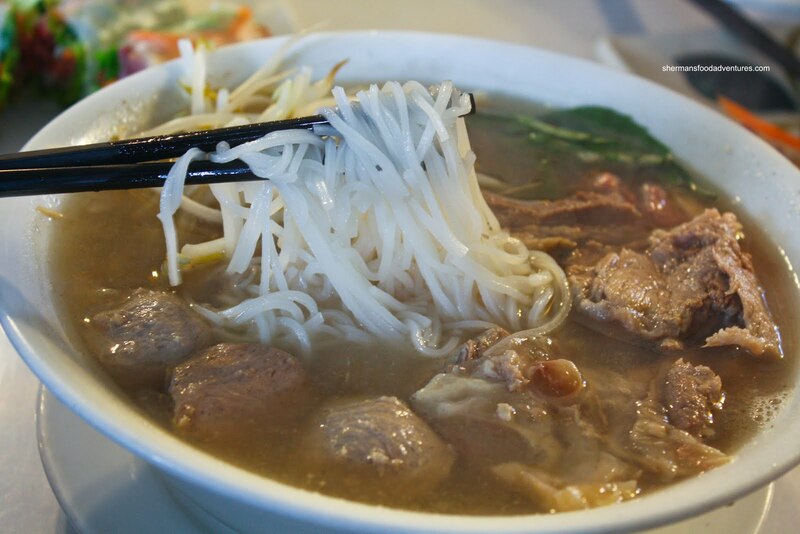 Now the obligatory Phở đặc Biệt with all the meats. The first thing that struck me was the very flavourful and aromatic broth. It had a good amount of meat taste and full of body. My suspicious pointed towards MSG. Shortly after my meal, it was confirmed when I was craving a really large Big Gulp. The noodles were done perfectly; but the meats were not to my fancy. They were coarsely sliced and not tender at all. That itself ruin it for me. I don't prefer my meats to be chewy. Rich Guy ended up with the Lemongrass Chicken. Hmm... What's up with this dish? Even without Viv, we have it on the table... again! 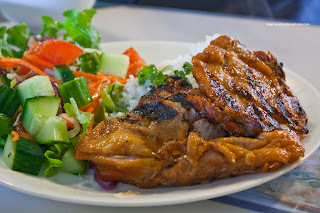 Anyways, there was plenty of tender, charred chicken on perfectly cooked rice accompanied by a fresh salad. Everything on the plate was good except that the chicken was sorely lacking in lemongrass flavour. It was as if it wasn't there at all. Too bad really. In fact, the food as a whole was not bad; but the Pho was disappointing. Too much MSG and chewy meats. I'll take a pass. Too bad about the MSG as I really liked the vibe of this restaurant, kind of cosy and down to earth. Unfortunately, there is a dearth of good vietnamese restaurants in Richmond and since I had a craving for grilled pork, I tried Thai Son today. I was peeved to find out later from my co-worker that they also put too much MSG into their food. That means, the only dependable (no smg) vietnamese place is Phnom Penh in Vancouver, but it's a little pricey and there's no free parking. I guess I'll have to bite bullet when I'm craving their garlic fried chicken and butter beef. @Holly Yah, it's too bad because there are many ppl who like this place. 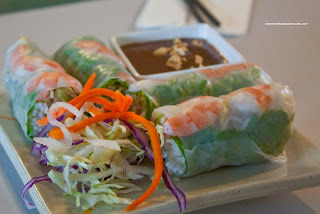 For all the Vietnamese food I've tried, this just didn't do it for me.